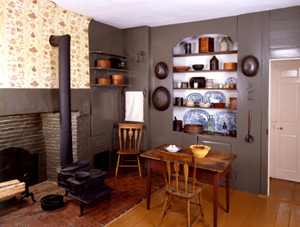 The kitchen of the Wadsworth-Longfellow House, 2002. Much of the kitchen's original configuration survives with its dominant cooking hearth, fireback, and bake oven. 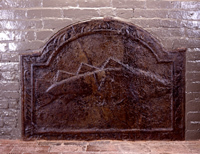 The iron fireback, set in 1785 into the firebox, radiated heat to make the large fireplace more efficient. Cast with an image of a codfish, it is a rare example of the work of Joseph Webb of Boston. To Samuel Longfellow, it was a fish "baked in effigy." Here, as in other rooms, the family stayed abreast of technological innovations to ease burdensome chores. Architectural and written evidence reveal many modifications between 1786 and 1853. The arched cupboard dates to the 1826 improvements in the adjoining sitting room. A cook stove was added by at least 1850 when Anne Longfellow Pierce recorded looking for fuel. Although low and small, it offered the Victorian cook conveniences not known in hearth cooking. During Anne's occupancy, a pump was installed to bring running water into the kitchen from the cistern. Photographs by Mary King Longfellow document Anne's modest kitchen with early nineteenth-century painted chairs, oil-cloth table cover, and basic housewares. Microanalysis documented more than fifteen layers of paint on the plaster walls before the first layer of wallpaper was applied in 1853. These many coats refreshed a space quickly soiled by smoke and grease. With the addition of wallpaper, Anne delighted that "the old kitchen is quite fine with its shining flowered walls." Fragments of her paper survive under varnish. Household manuals advised varnishing so the paper could be wiped clean. A glossy greenish-gray woodwork mitigated signs of soil. To ease access to the well and domestic yard, the Longfellows converted the kitchen's north window into a door in 1807. Attached to the house, the wooden "porch" extended to a wood house, then the barn and privy. Along its western exterior side, a raised wooden walk ran from the rear hall door. Terrified of the risk of fire the wooden ell posed, especially after the barn burned, Anne Pierce decided to make a brick replacement "a precise repetition of the old one." Masons and plasterers were at work in May 1852.